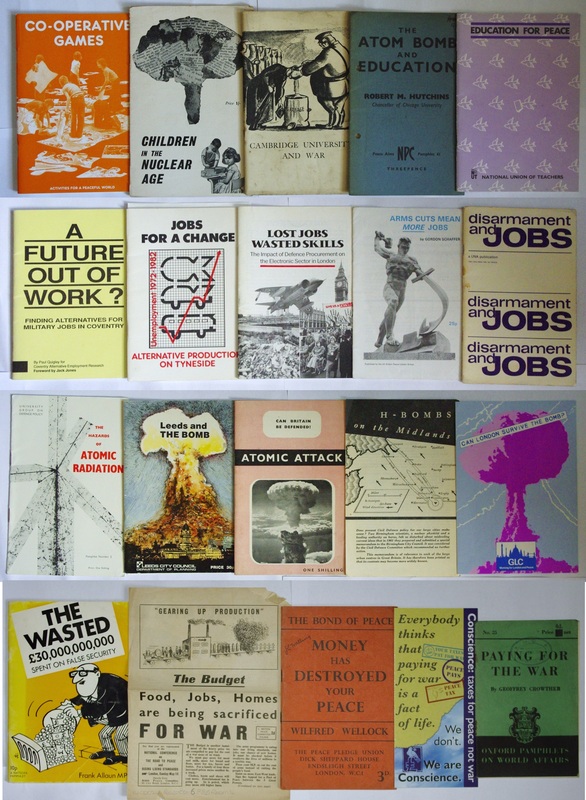 The Working Class Movement Library houses a huge number of pamphlets produced by organisations campaigning for peace. Subjects such as nuclear weapons, defence and disarmament overarch most of the collection. Other subjects from Christianity to military science, to foreign policy and pacifism also feature. Here we’ve selected just a few examples to give a flavour of what can be found. Dating from the 1950’s – 1980’s these pamphlets widely analyse likely effects of an atomic bomb. Three also critique the civil defence strategies laid down by central government. Government use of taxes and redirection of assets to support war is a common criticism of these pamphlets and Money has destroyed your peace takes the wider view that the struggle for economic power leads to aggression and war. These pamphlets also criticise concentration of resources on military rather than civil sectors. Particularly, they focus on the unstable jobs provided. Some go further, encouraging people to think about disarmament as a practical reality and suggesting alternatives. Education to encourage peace is a common theme with education pamphlets. The Atom Bomb and Education explains that all children need to be educated in this way to ensure future leaders have peaceful hearts. Cambridge University and War also talks about how the University can be used to prevent war.